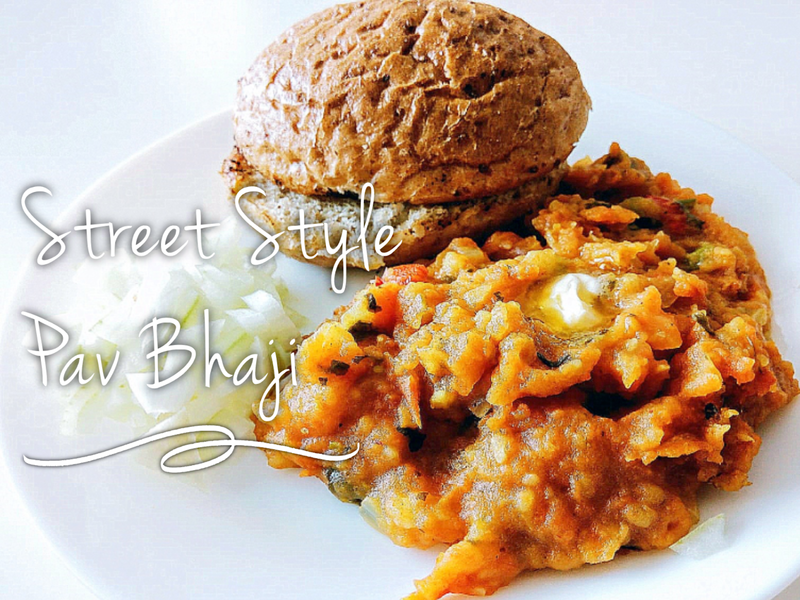 Pav Bhaji is a hugely popular street food in Maharashtra, India. 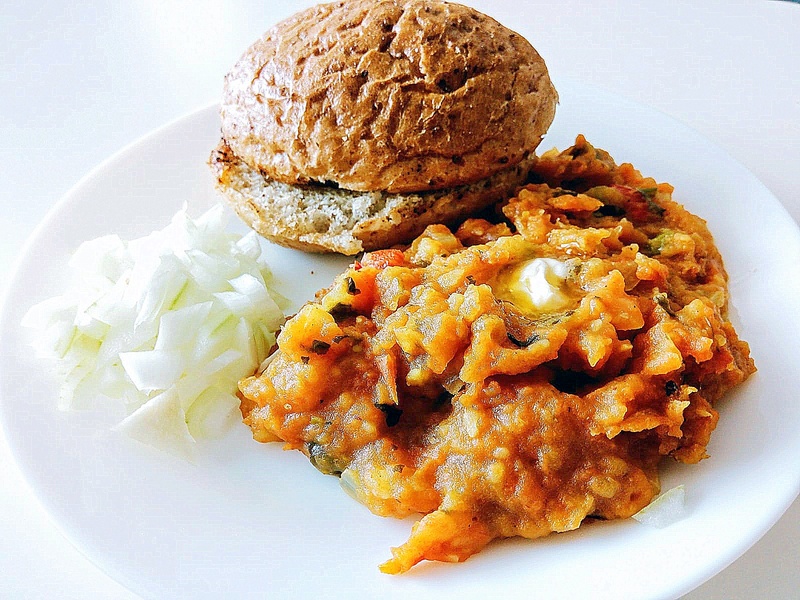 "Pav" means bread and "bhaji" means vegetable or vegetable curry. 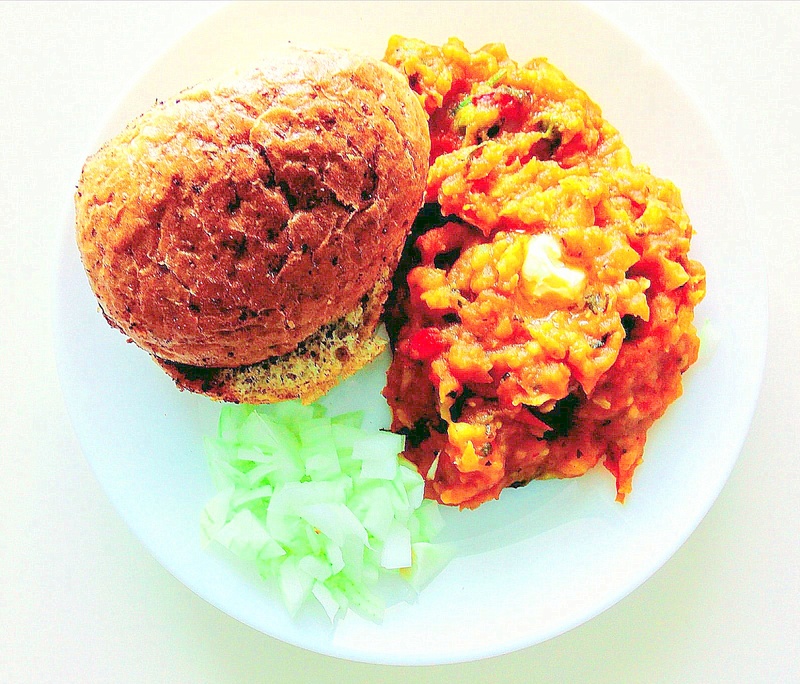 Thus, both together make a delicious and healthy combination of bread and mixed vegetable curry topped with butter. Potatoes, capsicum and peas are the most commonly used vegetables in this dish, but you can also add carrots, cauliflower and french beans to make it more healthy and colourful. The dish uses a special spice blend called "Pav Bhaji Masala" which is easily available in any grocery store of India or can be made in home too. Here is a step-by-step recipe to make the dish just like the ones available in Juhu beach or Chowpatty style. In a large kadhai or skillet, add 1 tbsp. butter. 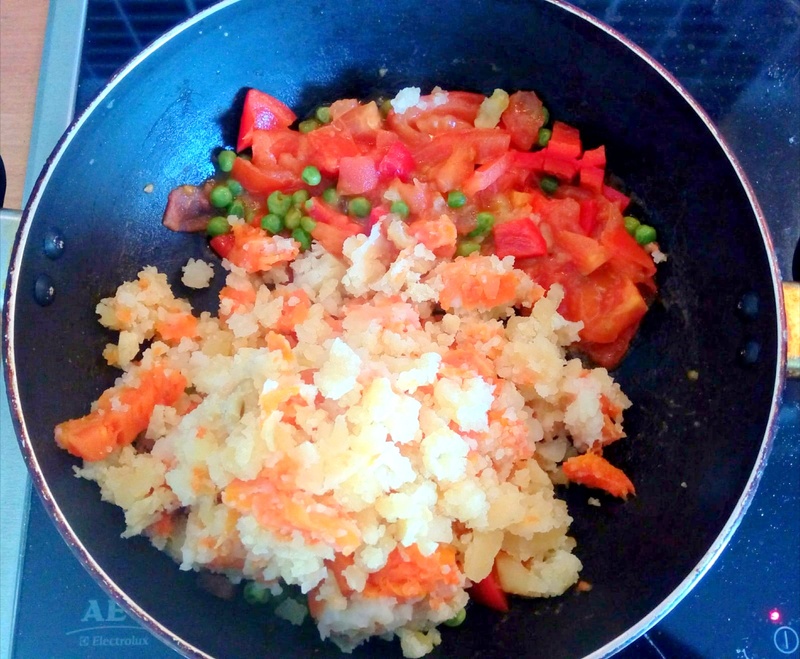 Add tomatoes, peas, capsicum, potatoes and carrots. Cover cook for 10 minutes. Add 1 tsp. chili powder, 1/2 tsp. turmeric powder, 1 tsp. 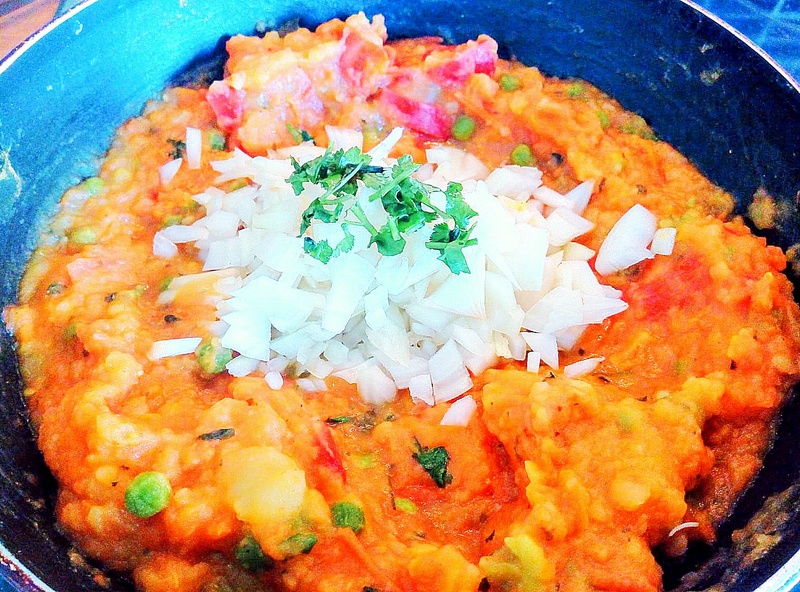 pav bhaji masala, 1 tsp. coriander leaves, 1 tsp. kasuri methi and mix well. Make sure the spices cook well and blend properly. Create a space in the center of the cooking vessel by moving out the mashed vegetables to the sides. Into the cavity, add 1 tsp butter, 1/2 pav bhaji masala, 1/4 chili powder, 1 tsp kasuri methi and salt to taste. Allow the raw spices to fry for some time and then mix with the rest of the vegetables. Add some more onions for a crunchy texture. Add about 1/2 cup of water and keep adding according to your desired consistency. Cover cook for another 10 minutes. Squeeze in juice of half a lemon and mash the vegetables till the texture is smooth. 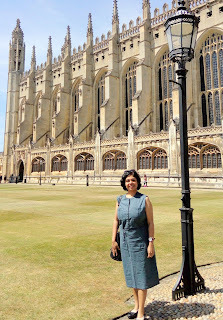 In a frying pan, heat 1/2 tsp of butter and fry a pinch of pav bhaji masala and chopped coriander leaves. Now split the pav bread in half horizontally and fry with the spices. 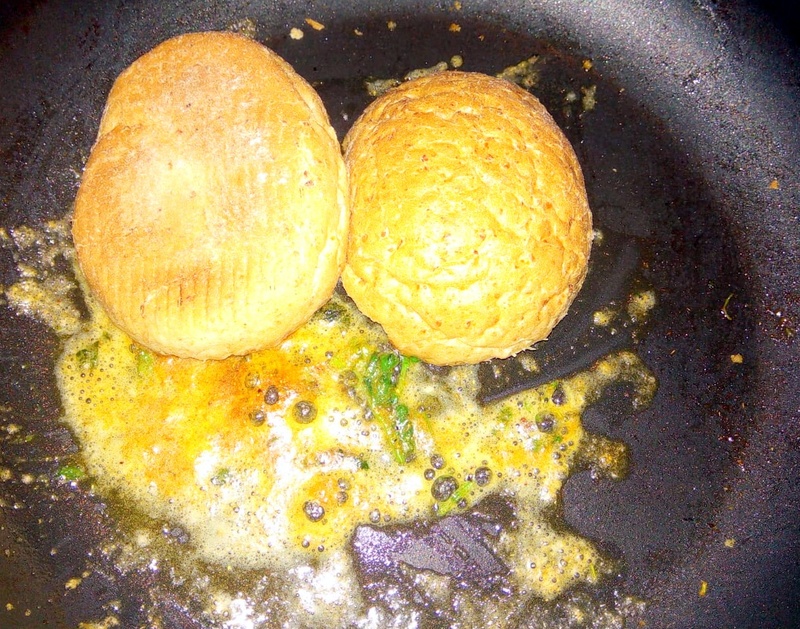 Fry till both the sides of pav are warm enough. Serve pav and bhaji together by garnishing with a dollop of butter and chopped onions. Additionally, you can also serve a slice of lemon and chopped coriander leaves. Enjoy the spicy and hot dish with your loved ones!